It is our goal to provide the best, Christ-centered education in Acadiana. As we continue to build on the firm foundation of academic excellence already at Westminster, we are excited to announce some planned advancements. Our overall goal is to make sure Westminster's subject offerings are not only superior, but that each subject is aligned in such a way that a student moving through the grade levels at WCA will benefit from coordinated and appropriate instruction that will lead him successfully to the next steps. Students in grades 4-6 transitioned this year to read more great literature. This approach will be continued and moved into the lower grade levels. Our high school students have already been reading some good works, but we will improve it a bit and begin to change some of the focus in the classes. Transition at the upper grade levels to focus less on grammar (as the elementary level improves) and more on literature and writing. I hope we can begin to introduce students to college-like discussions that are challenging and interesting. Summer Reading will be the same books for each class (purposefully chosen to guide students into the next school year), but will be limited in number (generally two). The assignments for the books will be posted online so there will be no need to come to the library for a test. However, we hope to have some great options for you in our libraries so please do not be a stranger. Specific details will be announced and posted soon. We have not forgotten writing! We will be working toward some long term goals in the area of writing and will be transitioning over the course of a couple of years. The end goal to not merely assign and grade writing as is common around the country, rather we will TEACH good writing. The history sequence from K-12 will be more suitably aligned. Your student's education in history (and literature and math, etc.) will not look the same as other local schools. They will have more, different, and better knowledge to apply to life. Grades 1-5 will continue to use their Bob Jones history text, but will do so in an abbreviated format so that we can add a chronological look at all of history (Veritas History Cards and songs). This will better prepare students for the next level of study in history, but will also give them a better context for the understanding of literature and the Scripture. The upper school history sequence will be changed a little. This will give our students a transcript that looks different and actually is better than others in the area (while still qualifying for TOPS). Grade 4 – Early explorers and early U.S.
All of these changes will allow for a greater understanding of our Founding Principles and more college level discussion of topics as students enter grades 10-12. As students at Westminster progress into their high school years, we want them to have more flexibility, greater opportunities, score higher on the ACT, and be ahead of their counterparts at other local schools. To accomplish these goals in mathematics our goal is to prepare students to be ready to take Algebra 1 in the eighth grade. This will give high school credit in math to eighth grade students and then make it possible to take calculus as a senior or open another elective option. Not only that, it will give our students more math knowledge as they take the ACT. This is a different and better pathway than offered at public schools and most private schools. In order to accomplish this goal, we will be making some adaptations in middle school, but we will be shifting a few things around at the lower grade levels to allow students to have a smooth pathway to Algebra I in eighth grade. As you can see, the lower grades will continue to use A Beka math. A Beka lays a firm foundation of basic math concepts that are needed at all other levels. It also allows for more regular review of material to acquire mastery. While the idea of repetition may seem to make common sense, it is often skipped in schools all over the country. Starting in grade three, students will use Bob Jones math books. In recent years we have examined a variety of options for transitioning students from basic math to more complicated Algebra and critical thinking skills. With the distinct goal of preparing students for Algebra 1 in eighth grade and refining how we will use A Beka resources, Bob Jones became the clear choice of teachers and principals. We recognize not every single student will be ready for Algebra I in eighth grade, although we will certainly try to make it happen. In such cases, we will have a different option that will still put a student on the traditional pathway to take four high school credits of math. In such cases, a student may not be ahead of the curve, but they will not be behind it. We desire to challenge every student toward excellence in mathematics and will expect the best of what they can accomplish. As one might imagine, Bible is an important area for us. 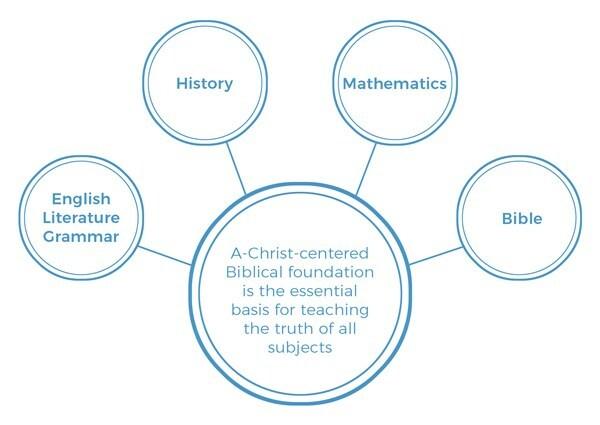 With a strong foundation of Biblical concepts and modern application already being taught in our classrooms, we are moving toward a coordinated program to transition students from the earliest grade levels all the way to graduation. Over the next few years we will be transitioning Bible offerings in grades 1-12 to Summit Ministries materials. This will be implemented in many of the grade levels this fall and complete transition in other grade levels over the next year or two as more Summit materials are released. Summit Ministries has been around for a few decades now. They are a highly respected and trusted source of worldview training for young people and adults. Our own Mrs. Brooks has been on the governing Board for Summit Ministries and many of our staff have attended conferences. Some of our students have also benefited from Summit summer programming. The high school materials are ready now and will be a wonderful resource for us in addition to our history of religion class (or world religions). Our upper school Bible teachers are also excited from this transition as we know Summit materials will give our students the best exposure to Christian ideas, including modern topics, that tend to challenge students as they go to college.